Day of rest. We went to church in Eugene. It was only 3.5 miles away from the house. The ward was surprised to find a family of 10 walk in that nobody knew. We met a couple of runners there. One was a 4:22 miler back in 1948 in high school, and back then they ran the real mile, not 1600. The other was 35 years old, still running, personal best of 9:45 in 3200 in high school. Stevie did not want to stay in nursery, so I ended up taking him to the Elder's Quorum. Friday night Jenny asked me a question about how to deal with the pre-race anxiety. I struggled with that question in my teenage years. It was a big deal. I wondered how in the world an Olympic athlete is able to deal with the pre-race pressure. After I came home from a mission I did not struggle with it as much anymore, the answer seemed to be intuitive, but I never had to explain it to somebody else. Challenged, I gave it some thought and tried to put into words what I knew. Then a few ideas came to me, and I saw them plainly. So here they are. I recall a study done of performances by Kenyan distance runners vs US/European runners in high stakes competitions such as world championships and the Olympics. There was a pattern - Kenyans frequently ran PRs while the Westerners frequently bombed. The author of the study tried to find an explanation and reached for such odd things as the Kenyan tradition of boys being circumcised in their teenage years without a pain killer and with an expectation of showing no signs of pain. The answer is actually quite simple, I believe. The key is Alma 5:27-28, and the key phrases there are "stripped of pride" and "sufficiently humble". Also, Doctrine and Covenants 88:6 with the key phrase being "descended below all things". One major driver of pre-race anxiety is the perceived pressure to perform and the worry of what others will think of you if you fail. Someone who grew up in the Kenyan-type poverty is vaccinated against that. He knows that there is no way that anybody will think of him below what he has already experienced so he is not too worried about that. The other key driver is the worry about the pain and your ability to push through it. Through my own racing and through pacing others I gained some understanding of this matter. This is how I prefer to describe it - at some critical point in the race you start to think that you are too good for the pain. Somehow in your subconscious mind you think that it is below the dignity of a human being to experience so much of it. So you slow down. Again, the root of the problem is the wrong kind of pride. You are not willing to descend below the pain. Through those experienced I gained an appreciation of the idea of Christ descending below all things - a frequently forgotten part of his Atonement. We often think about a mortal not being able to rise above - to travel at the speed of light, to command the mountains to move, etc, but we forget the limitation we have on descending below. No matter how hard we try our humility is limited - there is only so much beating we are willing to take before we call it quits. But Christ showed us perfection in this regard and challenged us to reach it. Running is a great tool for the purpose. To clarify we need to say that we are talking about true humility. Telling everyone around you how unprepared or unfit you are is actually a manifestation of disguised pride. True humility gives you the power to align yourself with the way things are which enables you to see clearly and follow the path to making them better. It gives you the strength to forget about the irrelevant and only focus on the fundamentals that matter. It gives you the power to succeed. Drove back from Eugene to Orem. The route through Portland was quite a bit longer not only in distance but also in time - 15.5 hours as opposed to 14.5 through Winnemucca, NV. Got some running on the road and a little bit after we got home. Total of 11 miles. Benjamin did 8, Jenny 2, Julia 1.5, Joseph 2, Jacob 2, William 0.5. It was nice to be able to pump my own gas once we got to Idaho. The question I have is if Oregon and New Jersey can get away with keeping people from pumping their own gas, why do we worry about what others think of our alcohol laws here in Utah? A.M. Ran with the kids. Total of 13 miles. Benjamin did 8, Jenny 3, Julia 2, Joseph 3, Jacob 2, William 0.5. I did two pickups of 500 meters on a hilly stretch. 1:36.1 on the part that looked down, 1:37.9 the other way. A.M. Total of 12. Did a workout with Benjamin to give him practice for track racing. We ran 1200 passing each other every 50 meters. I hoped to keep 75 seconds per lap, but it proved more hectic than I thought. We only managed 3:54.1. Benjamin's Croc fell off in the middle as well and we had to stop to put it on. This was also rhythm breaking. This is the first time this happened to him in a workout. Need to evaluate why. Crocs definitely have a lot of advantages. Aside from the cost and the shocking effect on the observer, and the convenience of no shoe laces is critical for training little kids, the main driver for Benjamin is the lack of forced traction that would be caused by spikes. Going around a curve in spikes is not good for young legs. So I estimate the chances of Crocs falling off in a 1500 meter track race are somewhere around 1%. That is OK. A possible little comedy, and even a DNF in a "critical" youth race - in quotes because I do not believe any youth races are really that critical - is a small price to pay for healthy feet, legs, hips, and lower back in maturity. Also for the shock effect of achieving a spike-quality performance the 99% of the time when they stay on. After that we jogged 200 meters and I wanted to test Benjamin's sense of pace in absence of the surges as well as the ability to lead, so I had him lead a quarter at the effort that felt the same as the the 1200 interval. We ended up with a 78.9 400. Odd - I thought we would see something like 75-76. Then we jogged maybe 100 meters, and I did not want to end the workout without ever running Benjamin's target pace for 1500 meters. So I paced a 400 in 72.2. Then we ran with other kids. Jenny did 4, Julia 3, Joseph 3, Jacob 2, William 0.5. A.M. Jacob's 7th birthday is on Sunday. We have a tradition of sorts if the weather is good and suitable for the mile record and if the child is young enough for me to be able to pace it (Benjamin has already graduated from that) to try to set one while the integer part of his age is still one year less. So Jacob did a mile time trial today at the Orem High track with Joseph being a front running helper. I wanted to see how he would handle 6:40 pace. I botched it a little with a 1:38 first lap, but he responded cheerfully and followed me. In the second lap I sensed that he was starting to have a small difficulty breathing. I gave him his inhaler before the start of the run, but I think the dust from the small particles evaporating from the hot track was perhaps too much for him. It was even bothering me some. I eased off the pace to 1:43 for the next lap and we hit 800 in 3:21. Then Jacob's breathing problem got worse and I eased off the pace even more - next lap in 1:46. He was able to hold it together for the last lap repeating 1:46 and finishing the mile in a new PR of 6:55.1 improving his time by 2.7 seconds. The balance of 2 seconds went towards the 9.34 meters extra on top of the 4 laps. Joseph ran 6:53 and felt quite comfortable. Even though this was only a small improvement, I was quite happy. Based on how Jacob handled the opening lap I knew that he had at least 6:45 in him if he could control his breathing. Also, from the trivia perspective - while still officially 6 and with all of the baby teeth still in place (although one of them is currently loose), he is now a 6:55 miler. After watching the race in Eugine and studying results of the USATF regionals I realized that sub-7:00 mile at the age of 6 is perhaps not exceptionally unique. But it is unique in our family. Jacob so far has shown most talent of all of our children. The key is to properly guide him through the development so he will not lose it. Then I ran with the other children. Benjamin did 8, Jenny 4, Julia 3, Joseph 3, Jacob 2, William 0.5. I did some pickups including a 100 uphill at 6% grade in 18.8. A.M. Total of 12 miles. Ran with the kids. Benjamin did 8, Jenny 4, Julia 3, Joseph 3, Jacob 2, William 0.5, Andrew 5. Julia wanted to do a time trial. So we did 400 meters at the Orem High Track. She ran 85.7 opening with 20 then 21, 22, and 22. This is a new PR by 6 seconds, and it is good to know she has some quarter speed. Then after jogging a little bit I wanted to see what she could do in 100. She did 19.3. So her 100 ratios for the 400 and 800 are 4.44 and 9.89. For a comparison, I have 59.5/13.9 = 4.28 and 2:12/13.9=9.50. Valery Abramov, the current Russian record holder in the 5000 (13:11) had 48.8/11.2 = 4.35 and 1:46/11.2 = 9.46. So her ratios are actually not too bad for a 10-year-old girl, but we do need to work on speed endurance. I also did some pickups. 500 on my hilly course in the faster direction in 1:34.8 and 400 uphill in 75.1. Ran the Draper Days 5 K in 17:14, 17th place overall and 3rd master, $25. There is something special about a 5 K road race at 4500 feet on a certified loop course with some hills where breaking 15:00 is not enough to win, breaking 15:10 is not enough to be in the open money, and breaking 17:00 does not get you into the top 10 while there are only a little over 200 finishers. 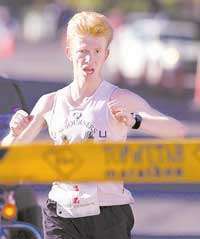 This is Fast Running Blog officially the most competitive road 5 K in Utah - at least I do not know of others. This our Carlsbad 5 K minus the mass participation. I brought Benjamin with me to the race. We warmed up about a mile together along with Steve Ashbaker, and then the race started. Everybody started very fast. Then some younger runners slowed down creating a roadblock of sorts. Benjamin and I worked our way through the crowd and about half a mile into the race caught up to Steve Ashbaker and Steve Anderson. Once we did, either they joined us or we joined them - it was probably mutual - we slowed down some and they sped up some. We worked together for some time. The mile at the official marker which I believe was accurate was 5:22. The first mile appears to be a slight uphill. I felt just right. In the second mile my legs started to feel more tired. Ben Van Beekum passed us. I tried to hang with him, but I could feel that my legs lacked the strength. I missed the mile 2 split, but Benjamin remembers the split being 10:43 which would have given us 5:21 for the downhill mile. In the meantime we were gradually closing the gap on Walter who was maybe 15 seconds ahead at the mile. He being the master was a target for me and Steve. I was not unhappy about my time - this is an improvement compared to Murray Fun Days, but I was much happier about Benjamin's. 17:01 in a road 5 K on an honest course at altitude is quite solid for a 14 year old boy. Josh McGabe won overall with 14:53, then Teren 14:59, Riley 15:04, Jake 15:09, and Scott Keate 15:25 for the top 5. I ran total of 12. Jenny did 4, Julia 3, Joseph 3, Jacob 2, William 0.5, Benjamin 8.